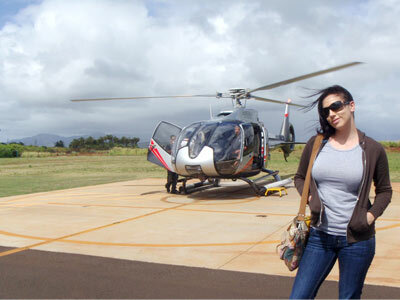 A helicopter ride ride over any one of the Hawaiian Islands is an experience unlike any other. The sensation of rising straight up from the ground, the sheer power of the helicopter’s turbine engines, combined with it’s spinning blades, bring you a view of Hawaii that is beyond compare. Many areas in the Hawaiian Islands are remote and inaccessible due to steep terrain, covered in dense vegetation, with sheer cliffs dropping into the sea, and even volcanic craters such as Haleakala Volcano on Maui. If you want to see actual erupting lava, with a helicopter tour on the big island of Hawaii that’s not a problem. There are a number of tour operators specializing in aerial tours of active volcanic hot spots such as Puu Oo cinder cone and other active areas around Kilauea Volcano. There is almost no other way to get this close to erupting lava. Unless you have the time and desire to spend an entire day hiking in to these wild areas, the only way to see them is from the air. A helicopter, with it’s ability to hover over scenic spots and climb and descend vertically, is uniquely suited to this sort of aerial touring. It’s really the only way to get down in to some Hawaii’s steepest areas and view some of the world’s most breathtaking canyons, waterfalls, and rocky headlands. While helicopter tours are not cheap, they are well worth your money, for in return you will have an unforgettable day.